Internationalizing and decolonizing political ecology is the focus of the recently published ‘International Handbook of Political Ecology’ and its primary raison d’etre. However, there is clearly much more to be done in the ongoing project to make political ecology a collective, cohesive community. If, as Diego Andreucci noted on this blog three months ago, the Routledge Handbook of Political Ecology was then “perhaps the most ambitious essay collection to date on political ecology”; this status has now been contested by the new International Handbook of Political Ecology, edited by Raymond Bryant. Indeed, as Bryant notes in the introduction to the volume, this is a task that began over four years ago, thus taking two years longer than the Routledge Handbook to come to fruition. Published by Edward Elgar Press. 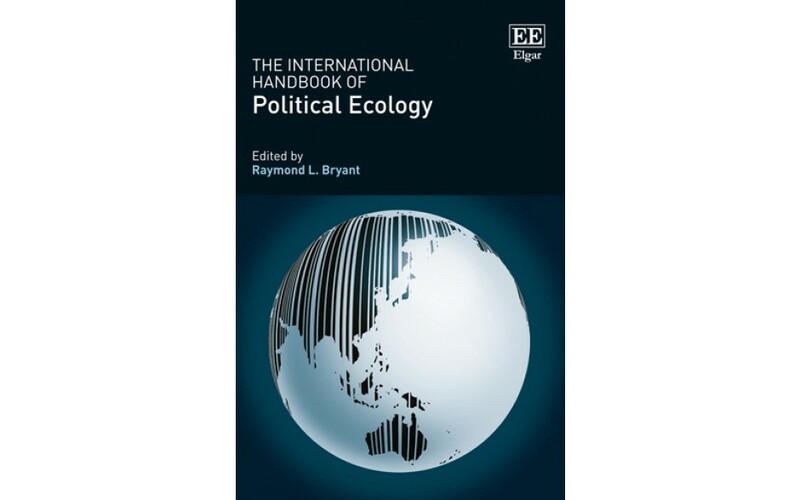 One may ask why the need for yet another edited volume on political ecology, as did Gavin Bridge and Raymond Bryant when first asked to produce their respective handbooks. Indeed, even before the Routledge Handbook of Political Ecology, there were already numerous introductory text books to the discipline, such as Paul Robbins’ Political Ecology: A Critical Introduction (two editions); Tim Forsyth’s Critical Political Ecology (2003); and Roderick Neumann’s Making Political Ecology (2005), among others. However, the International Handbook of Political Ecology tells a different story than all of these. Taking on recent criticisms of political ecology – and other related disciplines – of being too anglocentric, the book showcases the vibrancy of political ecology today, while also providing crucial updates on innovations on new topics, methods and theories being investigated by political ecologists. While the Routledge Handbook of Political Ecology also contains a few chapters outside of the Anglo-American tradition of political ecology, the internationalization of the discipline is the focus of the International Handbook of Political Ecology’s chapters, and indeed its primary raison d’etre. This internationalization of the discipline is not only seen in the diverse racial, ethnic and cultural profiles of scholars included in the handbook, but also focuses on different regional and linguistic traditions of political ecology. The Anglo-American tradition is covered by Simon Batterbury; while Enrique Leff focuses on the Latin American formulation of the discipline.Despite its omission of parallel overviews of African, European or Asian political ecologies, which can perhaps be explained by the lack of linguistic commonality within these regions, there are several empirical contributions focusing on several of the countries in these continents. For instance, chapters by Lei and Yeh examine political ecologies in and of China, considering especially the environmental implications of its rising population; while Neo & Pow look at eco cities in China, and their political connections to Singapore. Likewise, Seungho Lee looks at the critical issue of environmental governance in Southeast Asia’s Mekong region, and Kimura considers the legacies of Fukushima in Eastern Japan. Separate linguistic traditions of political ecology, namely écologie politique (French); ecología política (Spanish) and Lusophone political ecology (Portuguese) are reviewed in different chapters, which focus on the (often overlooked) impact of these fields. For instance, Denis Gautier and Baptiste Hautdidier discuss the French tradition and its relations to the Anglo-American cannon, which (until now) have not been examined. These chapters also get at the linguistic politics inherent in the globalization of academia, and political ecology, particularly given the hegemony of English as the primary working language around the world. There is also some concern raised about the status of political ecology as an international research community, and political ecology as a common endeavor, which in the past has been considerably fragmented and in some ways incoherent. The historic North-South divide of the discipline is critically examined by Shangrila Joshi, who highlights the complex post-colonial understandings of this difference, including the irony of how many actors in the South often use to their own advantage Northern essentializations and stereotypes of the South and its people. In doing so, she asserts the North-South binary as one that needs to be addressed with equal urgency as others that have historically been given more attention, such as nature-culture, human-nonhuman, global-local, and so forth. Similarly, Anna Zimmer argues that political ecologists have not paid nearly enough attention to non-Western cities, where most of the world’s population is now residing. Much like Joshi, she argues that we need to go ‘beyond the West’ and learn more from South Asian urban Scholarship, which offers important lessons about the ‘everyday’ state and urban encounters. Furthermore, Beth Rose argues that we need a diversification and decolonization of theoretical frameworks used in political ecology and in particular to pay more attention to indigenous epistemologies, rather than Marxian or post-structural thinking – which are rooted in (Western) European scholarly traditions. In addition to this regional, linguistic, and cultural diversity, some consideration is also given to different religions as an area of study in political ecology. For instance, Shanti Nair explores political ecologies of religious pilgrimage based on a case study of the hajj – the annual Muslim pilgrimage to Mecca in Saudi Arabia, which recently made international headlines. Nair argues that, while considerable attention has been given to indigenous relations in political ecology, the role and impact of world religions are rarely addressed, but are equally important as they connect with other primary themes in the discipline, such as governance, health concerns, and grassroots activism. To conclude, as Raymond Bryant remarks in his ‘reflections on political ecology’, the International Handbook of Political Ecology is an important milestone marking how far the discipline has come since its origins over four decades ago, but also challenges future scholars to take up some of the discipline’s current shortcomings in their research and scholarly practices. However, the focus of this book on regions outside of ‘the West’ and ‘the North’, is somewhat contradicted by its price – only available in hardcopy at a whopping $330. This makes the book unaffordable at all but the ‘elite’ institutions of Western Europe and North America (and a handfull of other regions). So, one task for future political ecology handbooks seems to be finding a way around increasingly profit-focused academic publishers. ← ENTITLE workshop on ‘Political ecologies of resource and rent extraction’. Thanks. Raymond’s ruminations on the field are worth a read and there are some excellent chapters. .I was not really covering a tradition, or doing the same as Leff in his chapter; my remit was to see how PE is actually ‘done’ and by who in the classroom, in print, in activist organisations, etc. around the world. There is a lot written about the contributions of PE, but rarely do we stop and think about how these contributions emerge, and from where. It turns out they are not instances of isolated scholarship, and they are clustered. This involved scanning the world for research groups, and their key publications. Africa, where I have worked a great deal, seems to have academic contributions to PE/teaching concentrated in South Africa for example, while by contrast the PE scholarship ON Africa comes from multiple global locations. The same with China. I noted the strong presence of PE in continental Europe these days and in Barcelona in particular. Ironically, I also described the JPE, a journal that is completely free (http://jpe.library.arizona.edu)! Its spread of articles, graphed, show internationalization away from the Americas, but slowly. A slow reverse colonization is occurring with more work from outside Europe and North America.